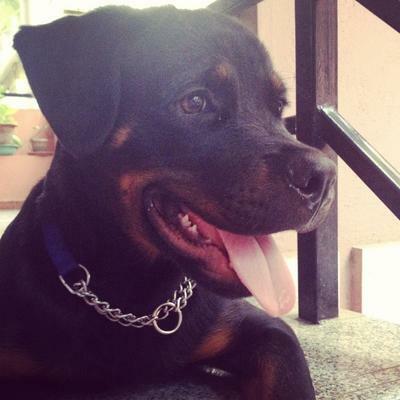 He is about 4 months old, father is an ADRK (Allgemeiner Deutscher Rottweiler Klub) German Import now living in India, and mother is the daughter of a dog that's won 30 odd times best of breed in India. You would know what ADRK stands for and what dog shows mean, if you are as crazy as I am. So from my study, it's said that Rotties are pretty much calm and friendly for 95% of the time. Its that 5% that gives them the bad reputation and the very fact that he can scare the sh*t out of you. My fellow, fondly called Caesar is generally very friendly. I rarely hear him bark when the gate opens during the day but late at night if someone touches the gate, he gets very alert. Sounds that are so loud in the neighbourhood, he tends to ignore completely. I wonder if he is deaf, but some faint sound somewhere you will see him alert. My granny always complains that you bought a Rottie but he does not bark when guests come home. You really don't want one like that because you will never have peace of mind. So back to what I have read about them, they do not react unless the owner is threatened. I didn't believe it considering he is so friendly, but then last evening I realised, yes Rotties are protective when it's required. I had taken him out for a walk last evening in the neighbourhood, so all of a sudden he wanted to relieve himself. It happened to be in front of a caravan kind of arrangement on the main road whose owner was sitting outside. Though I was about to clean it up, he by then had lost his cool and decided to scream and shout at me. He was sitting down then when the argument started, but 10 seconds into the same, he got up to come closer to me. Maybe to push me around or just that he was really furious. The moment he got up and stepped forward, I think Caesar realized something was not right. He began barking aggressively and lunging towards the guy, immediately he stepped back and stopped screaming. Probably realized coming near me was not an option anymore. My boy is still small, height up to my knee and weighs about 19-20 kgs. A few months more and this guy might not dare to step out of his caravan. PS : If you have a Rottie, you know how it feels..
His protective instincts (for the family) go beyond his concern for his own safety. It is great to see that in a 4 month old pup. Mine (now 2y9m) started the alertness-to-deviation-from-known situation when he crossed 5 months. We definitely do need these growlers in this impatient world. A four month old puppy lunging & snarling looking to bite? Sounds like an unsound pup bred from overly aggressive lines. Hope you have some great insurance overseas there. Yes I know the feeling, and I feel Safe when My Rottie is with me. Once they realize you are the leader of the Pack (Alfa) they will do any thing to protect that Pack, including Family!